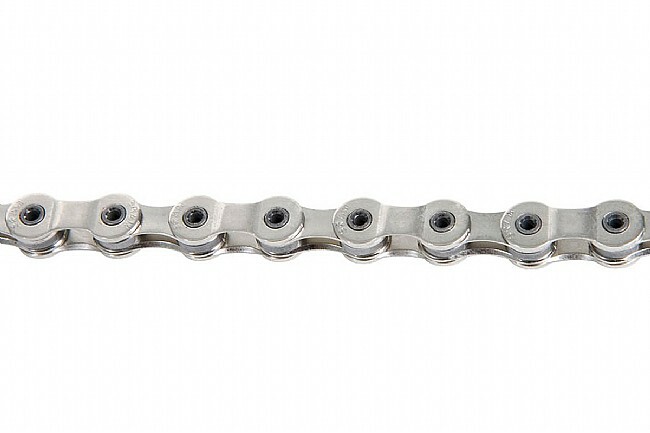 SRAM's high-end 10-speed chain weighs in at a mere 259 grams thanks to a hollow pin design. The 1091's outer plate is refined and reshaped from the previous 1090 design for quieter performance, and both inner and outer plates are nickel-plated to resist corrosion. Hollow pins are chrome-hardened for strength. PowerLock link is included for easy installation and removal; SRAM recommends that a new PowerLock link is used each time the chain is broken and re-connected. Recommended for use with SRAM Force/Rival 10-speed groups but is compatible with all SRAM and Shimano 10-speed groups. 5.9mm width, 114 links, 259 grams. Great value, durable and easy to maintain. Easy to find install. I've used this chain on both SRAM and Shimano bikes and it works great on both. The removable like makes it super easy to do a deep clean of the chain. You're supposed to replace the removable link each time but I've used it twice with no problems. SRAM Makes a Good Chain! SRAM and its chain link and way ahead of Shimano's system. I got about 1,800 miles out of the one this replaced, before my Park chain measurement tool said it was time to replace it. That one was using ProGold Xtreme. Based on recent reviews, I'm now using Rock'N'Roll Absolute Dry. I suspect this chain will last even longer. I bought this to compare against the SRAM PC 1071 chains that I typically run on my bikes. They run smoothly and are quite quiet, but the difference from PC 1071 isn't dramatic. The 1091 is lighter, so perhaps paying a few more dollars to shave grams from your drivetrain is worth it.